This play is one of the prolific Alan Ayckbourn's most often produced, on both the professional and amateur stage, said to be one of his most personal, and generally considered to be one of his best. It tells its story from the point of view of 'Susan', a woman in the throes of a mental breakdown, and she takes the audience with her on her descent into a full blown nervous breakdown. Not the most obvious of themes for potential comic material then, and though there are many laughs to be found along the way, the journey is often disturbing and unsettling. 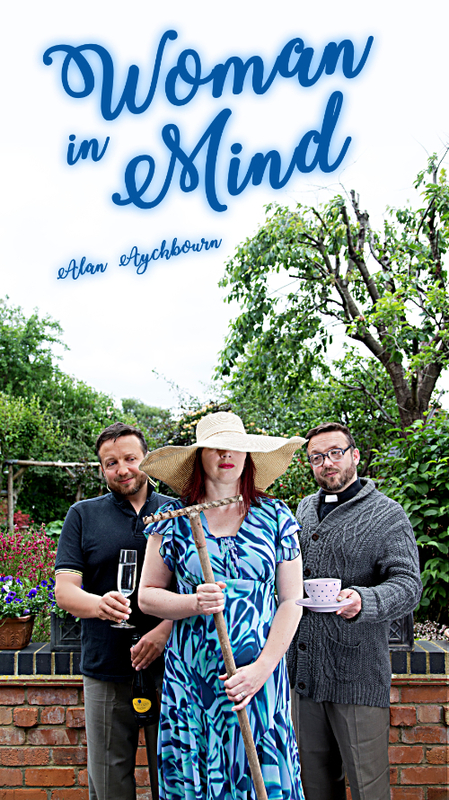 Susan is trapped in an unfulfilled life, a joyless marriage to a vicar, the insensitive and smug Gerald; has lost her son to a religious sect; and shares her house with her intense and irritating sister-in-law, Muriel, who pines for her dead husband. As if to compensate for her real dysfunctional household, Susan has hallucinations of a parallel but perfect family she has created in her mind: a caring, loving husband, a sympathetic brother and a doting, lovely daughter; though as the play progresses the truth of her situation increasingly becomes confused, and her already tenuous grasp of reality exacerbated. The family Doctor is sympathetic to Susan's plight but his concern for her begins to manifest itself in a way, it soon becomes apparent, that is somewhat less than professional. 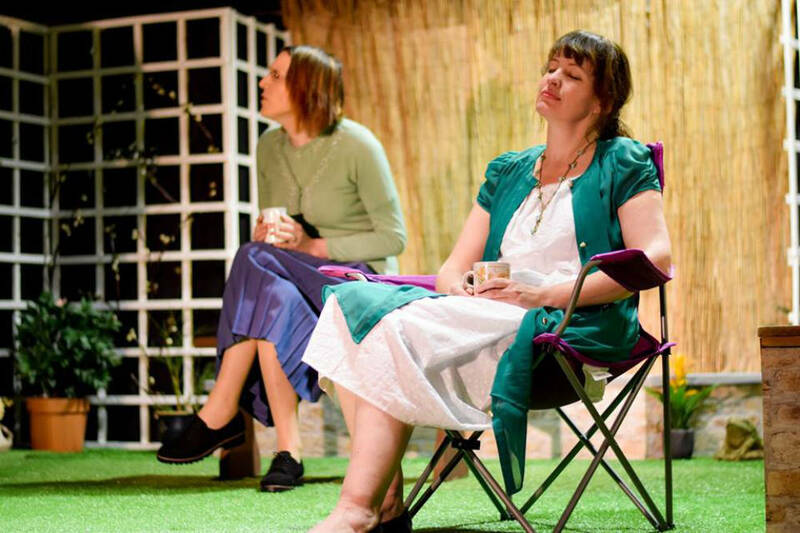 Ayckbourn's Susan is a great role, a challenge to any actress: on stage throughout and having to display a rollercoaster array of emotions. The talented Nicola Osborne rises to these challenges extremely well, in often subtle ways showing the audience that here is not only a neurotic, mentally ill woman, but one whose dreary life could have been so different, by no means without her own human faults, but a thoughtful, sensual and often funny personality. The two leading male parts were in the capable hands of two of Masque's finest: John Myhill as Dr Bill Windsor, and Martin Williams as Susan's husband, Gerald. John captured perfectly the kindly, ineffectual, accident-prone doctor who, as the play develops, we learn carries a torch for Susan, and that his own marriage could well be in difficulties. He opens the play talking fluent gibberish which we realise is what the troubled Susan is hearing so drawing us into her world. At one point, trying to reassure Susan, the doctor attempts a conversation with, to him, an invisible Lucy, the imaginary daughter, in a very amusing scene, and there is some terrific stage business with John and a rabbit he conjures up out of a handkerchief. 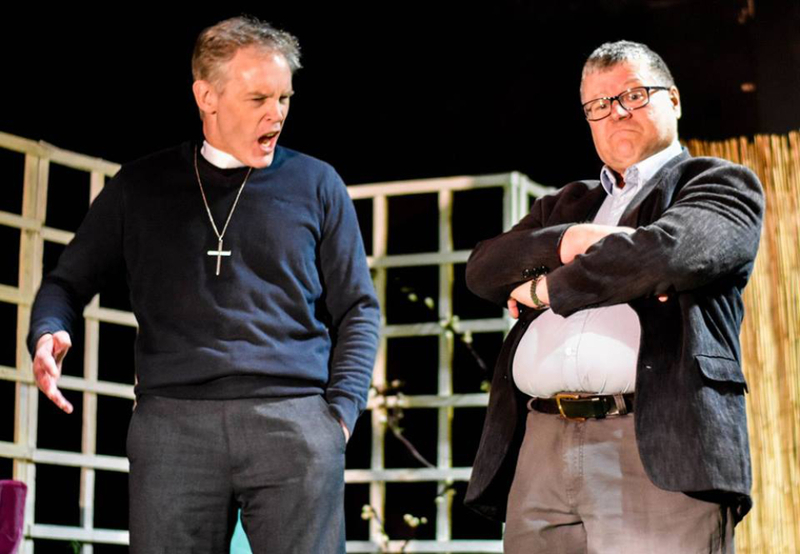 Martin Williams was brilliant as Gerald, the quite awful vicar; insensitive, insufferably pleased with himself and devoting much of his time to an excruciatingly boring history of his parish he has been writing for years. Extracting the maximum humour out of this mean spirited character takes a lot of skill and experience, but Martin managed this with ease, for example, Gerald's anguish at discovering that Susan had torched his beloved script, which was delightfully hilarious. The imaginary alternative family were competently played by Andy Rowe as Andy the husband, Sion Grace as brother Tony, and Emma Burgess, eye catching as the sweet and innocent Lucy. Invisible except to Susan, they first appear in bright summer clothes, all seems to be idyllic, and yet at the same time the actors made you feel that there could be something sinister about the trio. As Rick, the absent son forbidden to talk to his family by some religious cult, young Ciaran Redmond does very well, working effectively in his scenes with Susan, in particular. Also very entertaining was the performance of the eccentric sister-in-law, a spectacularly awful cook, every inch a dowdy discontent, and played with obvious relish by Megan Lucas, who somehow succeeded in making this most unprepossessing woman actually quite likeable. Experienced director Maggie Holland assembled a strong cast for this fascinating and multi-layered play and she got the best out of them. Technicals were again in the capable hands of Phil Welsh, accompanied in The Playhouse sound and lighting deck by the ever competent and reliable Jill Rhianna-Green, handling continuity. I was totally absorbed by this production but after the intensity of it all felt a tad drained and was most grateful for the proximity of the excellent Playhouse bar, and a splendid glass of decently chilled Prosecco. Woman in Mind was a notable contribution to this season of Masque productions. Well done to everyone involved. As Susan says at the end in her confused state: “December Bee!”, her version of “Remember me!”. I believe we will, and for a long time. This is one of Ayckbourn's blacker comedies, dealing with the gradual mental collapse of the central character as her real and imaginary worlds collide and mingle. Described by reviewers as: "one of the funniest plays, it is also the most disturbing," and: "a climatic Lewis Carroll-style nightmare which is both hilariously inventive and demonic." It is a play that needs to be well-rehearsed so that the cast no longer find it funny whilst ensuring the audience do! I am a fan of Alan Ayckbourn. In the past, I have both acted in and directed some of his plays for Moulton Players. I am delighted to be directing this one for Masque Theatre. It is one of his darker plays, dealing with the the mental turmoil of the central character. It is a comedy but much of the humour is of the "banana skin" variety: in other words, the joke is at the expense of one of the characters. The play is expertly scripted so that the audience see and hear the world that the central character, Susan, is experiencing. Some of it is real and some of it is hallucination, but which is which? Susan remains on stage throughout the play. Taking on this mammoth task is Nicola Osborne. With a nod to "repertory", her husband is played by Martin Williams, creating between them another dysfunctional couple after their outing a couple of years ago as Mr & Mrs MacB. The remainder of the cast are Andy Rowe, John Myhill, Sion Grace, Ciaran Redmond, Emma Burgess and (in her first proper acting role) Megan Lucas. All of them play very diverse characters. I wonder how many of the types you will identify with as someone you know? Masque Theatre's production is directed by Maggie Holland, whose shows for the group include Closer (2009), Entertaining Angels (2015).